Disney has recently released a couple of Blu-ray double movie packs of animated Disney films which I had not seen in a long, long time, so it was kinda cool to not only see them again, but in glorious high definition. These two double movie packs are The 35th anniversary edition of The Rescuers with its sequel The Rescuers Down Under, and Pocahontas with its sequel Pocahontas II: Journey to a New World. What's kind of amazing about the Blu-ray in both of these sets is that not only are these movies beautiful to look at, but one disc actually hold both the original film, the sequel, and the bonus features. Both of these sets actually contain 3 discs, one Blu-ray and two DVDs. Each of the DVDs contain one movie and then the extra features are split between them. And like other Disney Blu-ray releases, the cases have that outer slip cover that has the shiny reflective thing going on where you see various colors depending out how the light reflects off of it. I know this isn't anything to amazed at as this kinda thing has been around at least since I was a kid, but just they way the do it makes the cases look really nice and classy. 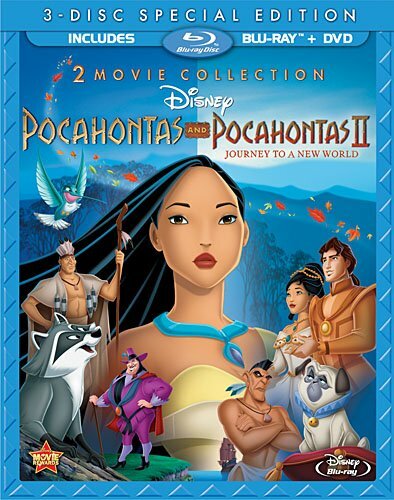 Pocahontas tells the story of a Native American tribe encounter the new arrival of Europeans to their land, and more specifically, the meeting of Pocahontas and John Smith. Pocahontas is the daughter of the tribe's chief, and he wants her to just go with the flow and marry a certain tribe member who fancies her. John Smith, on the other hand, is the captain of the ship and a warrior who is skilled at exploring new lands and subduing any pesky natives that get in the way. Yeah, and he's the good guy! The bad guy is Governor Ratcliffe, a fat cat bureaucrat who cares nothing for this new land, the natives, or even his own men. All he wants is to find gold so that he can bring it back to impress the King. He's really a one-dimensional character and I think that kind of hurts the story. While it was entertaining to watch, and had some beautiful artwork, I kinda felt like the plot hadn't really been worked through all the way. The Governor's insatiable quest for gold didn't make much sense as there was absolutely no indication that there was any gold there whatsoever, yet as soon as the reach land he has the men start digging. The language different between Pocahontas and John Smith didn't end up being a problem because she somehow magically started to understand what he was saying. I don't have a problem with magic, especially in Disney movies, but there was no explanation for this at all. It just kinda happened. And the ended seemed kind of abrupt. It wasn't a bad film, I just thought a little rewriting could have gone a long way to making it a much better movie. The second film, on the other hand, was disappointing. It starts by supposedly showing John Smith getting killed, though the way it happens ensures us that no, he isn't really dead. Thus, if he were to show up later in the film, it'd be no real surprise at all. In this story, Pocahontas travels with a new fellow, John Rolfe, to England where she is to meet the King and convince him that her tribe is not trying to start a war. She morns the death of her love, John Smith, for like half a second and then starts to fall for this new guy. So I guess all that romance in the first movie didn't mean squat. Anyway, I figured this would be an adventure, Pocahontas exploring and learning about life in England, but it turns out not really. She sings a song about the wonders she see when they first arrive, but after that John tries to make her into a prim and proper English lady so she can impress the King. And she does. You'd think the king would want to see the true face of this representative from a completely new world, but nope, he apparently he wants her to be exactly like everyone else. Yet then they all go on a bear hunt for some reason and Pocahontas tells them they are savages for doing this so she's arrested along with her animal pals and the king approves an invasion. I didn't really understand the overall purpose of the villain's plot. It's the same bad guy from the first film, Governor Ratcliffe, and he lies to the king in order to get him to invade and kill all of Pocahontas' tribe, but I don't get why. And it seems like it hasn't been all that long between the end of the first film and the begging of the sequel, yet Governor Ratcliffe convinces the king easily that John Smith is dead... because John Smith was able to heal from his injuries but was not able to report back to the king before Governor Ratcliffe had his men chase down and kill John Smith? And what was the moral here? Just be yourself? If Pocahontas was herself when she first met the king, I'm sure he would have arrested her immediately. It wasn't until he found out Governor Ratcliffe was a deceiving little snot that he magically became understanding of Pocahontas. So the moral is don't be a jerk king? I don't know. This one just didn't feel that interesting. My wife actually fell asleep during it, and I had to force myself not to a couple times. So the first one wasn't bad, but I don't think I'd really need to own it. I'd say this is probably a rental, unless you collect these or you (or your kids) are a big fan of Pocahontas. Deleted Song "If I Never Knew You"